It’s not just Salon and its sycophants on MSNBC who lie about Fox News. Raw Story is also fluent in the language of smears. How is this for a headline? Co-host Brian Kilmeade argued that it would be impossible to deport 11 million undocumented immigrants and their children. “There’s no way we can afford to kick out 11 million people,” he insisted. She is a special kind of stupid, isn’t she? Speaking for her brain-dead coalition, she clearly has zero grasp of the fact that deporting any group of 11 million people would be logistically, financially, bureaucratically, politically and physically impossible to accomplish. So why is Survivor Barbie now quoting VDare talking points? Elisabeth Hasselbeck’s brain. Does such a thing exist? Discuss among yourselves. 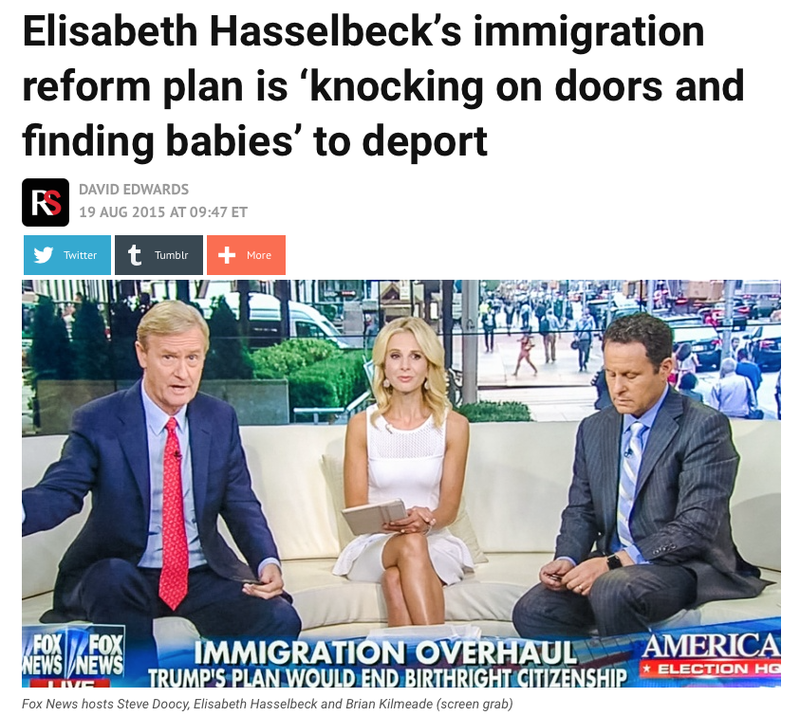 Go knocking on doors…says Nazi Hasselbeck! How is it that both the text quoted and the video embedded on the site clearly show Hasselbeck deriding Trump’s proposal, yet many commenters bought the lie in the headline? Because that’s how the game is played. People read the headline; many never bother with the text and only a handful will actually watch the video. And even when they do, some still swallow the spoon-fed spin. Thanks to sharp-eyed Cable Gamer Peter Fack for bringing this to our attention.